In this article we’re going to be discussing what the 10 best pond filters are, which exist on the market in 2019. However, to make sure that everyone’s on the same page (so to speak), we’re going to briefly discuss the function of a pond filter, how it works, when it should be used and other key question points that we get asked. If you’re well aware of what a pond filter is and how it works, then feel free to skip the following sections, until you get to the Top 10 Best Pond Filters [Skip to section]. Ponds are incredibly important for the maintenance of our ecosystem, being an important source of biodiversity. Most ponds are carefully maintained for water retention, conservation, and recreational purposes. Some ponds are even artificially created in back yards and parks to encourage biodiversity as well as adding decoration to the garden. Ponds are home to many creatures and insects that form part of the circles of the ecosystem. Like humans, animals and plants need water to survive. Having a pond can provide a safe haven to these animals who at any time might get dehydrated. By definition, a pond is an area filled with water either naturally or artificially. However, did you know that there are reliable determinants to the conditions of its location? If a pond has dragonflies, salamanders, and other sensitive species, chances are that the surrounding area is in a very decent condition. These types of animals reflect the environment that they are surrounded in, so if these insects are in your pond, then you have a healthy area. On the other hand, if the present creatures are of the likes of leeches, then perhaps, the area is polluted. To put it simply, if you pond is abundantly surrounded by flowers, plants, and animals that are healthy, then you have a healthy little ecosystem. If you are a homeowner with a backyard pond, or if you are planning to construct a pond, then you must consider getting the right tools for its maintenance. It has also been said that maintaining a pond is more difficult than actually building one… However we disagree with this statement, as with the right information and equipment, you’ll be able to manage your garden pond with ease. One of the biggest problems in pond maintenance is the buildup of mucky, sticky, green, and gross algae, as well as the water getting dirtier and unsterilized. We actually have an article dedicated to this subject, which can be found here, on how to get rid of pond algae. It is even made harder when you have fish and other aquatic species such as turtles which produces dirt through their poops and carbon dioxide when they are breathing. Therefore, if you have a pond and you intend to keep it clean and fresh to attract healthy faunas, then one piece of equipment you should have is a pond filter. Pond filters generally make maintaining your pond easier. If you are still starting your own pond and have zero ideas about finding the best pond filter, then read further and we assure you that by the end of this article, you will have everything you need to know not only about pond filters but also pond maintenance. What is a Pond Filter? How does a Pond Filter work? When should a Pond Filter be used? What should I take into consideration when buying a Pond Filter? Where can I find the best Pond Filters for sale? A pond is just like an aquarium, but bigger. Like fish tanks, for it to maintain its health and beauty, it needs its own filtration system. Pond filter pumps provide the required oxygen in the water to keep it clean, clear, and algae free. If you do not have a filtration system in your pond, chances are it will turn stagnant and attract dirt in the water. A pond filter is composed of a round container. This container has filter materials such as the cover found on top with hose connections. There are different types of pond filters which will be discussed further on. Filtration is an essential factor in maintaining a healthy pond. A pond filter is equipped with a filtration system, either biological or mechanical which will be discussed shortly after. For a pond filter to work, there must be a pump that pushes the water through it. Any water that passes through the pond filter, will be cleansed of any debris, bacteria, fungi, or virus’ that may cause harm to the health levels of your water and any species or fish living in it. It is a common misconception that pond filters only remove the physical dirt that can be seen with the naked eye. In truth and in fact, pond water filters work down to a bacteria level. A pond filter system has two ways in which it maintains the cleanliness of your pond: through a mechanical filter and through a biological filter. Therefore, pond filter pumps belong to either one of the categories and sometimes even both. In this type of filter, a pond biological filter contains the necessary bacteria used to convert waste materials found in carbon dioxide. The presence of carbon dioxide comes from the waste products of pond fish which might turn into nitrates and ammonia. These toxic substances will be turned by the bacteria into less toxic nitrates. This whole process is also sometimes referred to as the nitrogen cycle. The toxic substances move through the filter. Maintenance of biological filtration system must be followed accordingly to the manufacturer’s instruction. If you have no cleaning indicator, the need for a biological filtration system can be determined by a reduction in the amount of water flow or water passing over media in gravity filters. It is to be noted that in cleaning a biological filtration system, you have to use pond water and not tap water. Chlorine is present in all tap waters and the powder has the ability to kill off the beneficial bacteria which is the most important part of the biological filtration system. Additionally, there are bacterial supplements which can help and improve the performance of the beneficial bacteria. Pond filter pumps that are mechanical in nature functions in a way that collects debris and separates wastes and solids from the water. This is an important type of filtration system because it helps make the water look cleaner and thus the fish and other marine life can remain healthy and readily observable. A mechanical filtration system needs to be regularly checked. Since they physically collect solid objects, eventually you have to remove these objects before the pump gets full. It acts much like a vacuum cleaner for aquatic locations. In filtration equipment that uses a combination of both of this filtration system, it is necessary that the mechanical filtration comes first. This is so that the capability of the biological filter is kept at a maximum by having to filter only the tiniest objects that the mechanical filtration has missed. Maintenance of a mechanical filtration system is a walk in the park. Simply remove the mat or net in which the chunks of algae, leaves, and debris are collected. You could dump it into a trash can and could just easily rinse it off with water. With mechanical filters, you can opt to use tap water because there are no beneficial bacteria present in the mat or net. Unlike biological filters where it must only be cleaned when absolutely necessary, mechanical filters can be cleaned as often as you like. It is even recommended that you regularly check your mechanical filter for any debris that might have trapped and disrupted its functions. Taking into consideration both the types of filtration system, how does the water go through the filtration system? Well, this is where pumps get to work. The pump pushes and circulates the water so that it will go through the filtration system. For pond filters with both types of filtration system, the first stage that it will go through is the mechanical one. Debris, solid substances, and dirt will be trapped in the mechanical filter through the usual filter foam. The water, already cleaned out by solid particles, will then pass through the biological filtration system. Some have dedicated parts in their box for this process while others have placed lava rocks and bio balls inside the free space of mechanical filters. Some pond filter equipment do not even stop there. As some of the more expensive units even have a UV Clarifier that helps to remove any fungi, viruses, and buildup of algae that might have occurred in the water. If you think about it, the pond filter system is not that complicated, but now you are aware of the filtering process, let’s talk about when a pond filter should be used. Most rookies make the common mistake of wanting to turn off the pond filter pumps during night, to save on electricity costs or even, to turn off the sound that the pump produces to ensure a quiet night’s sleep. Although pond filters can actually take a toll on your electricity bill (if you choose the wrong one), it is highly recommended by seasoned pond keepers to still let it run 24/7 because the results might be more detrimental otherwise. Turning it off might be good for your energy bills, but it will have a negative effect on any living species inside the pond. When it is turned off, the bacteria that weeds out the toxic substances will die, and then toxic bacteria will cultivate inside the biological filter. Once you turn it on again, chances are some of the bad bacteria will eventually be pumped out to the water caused by the intervention which cut off the conversion process. In addition, it is common knowledge that stagnant water is always a bad thing for any aquatic area with living species in it. For a filtration system to be efficient and effective, it needs water to be moving through it. In addition, the biological filtration system might be damaged because turning off the filter removes the water inside them causing all the beneficial bacteria to die inside the container. In relation to the mechanical filtration system, such might be rendered useless if you turn off the pump because the debris and objects that you wanted to be filtered would have already sunk to the bottom by the time you turn it on again. Therefore, if you really want to maintain a healthy pond, it is advisable that you have a pump filtration system that is on for 24/7. To ensure that you have a clean and clear pond, you need to check on its water quality regularly. This will help sustain the fish that may be living in the pond and the other floras and faunas that thrive and rely on your pond. There are many considerations in picking out the best pond filter equipment for you. Skimmer Filter – Also known as surface skimmer filters, they remove leaves, foods, and other objects that can be found in the surface to its own self-contained mechanical filter. This type of pond filter pumps prevents alien objects that should not be found in a pond from sinking to the bottom and turning into algae food when it decomposes. They are technically ideal for any sized ponds which goes up to even 250 gallons. Skimmer filters are placed at a water level outside the pond liner. However, if you have or want your pond to have water lilies or other floating plants, then surely a surface skimmer filter would not be ideal for you. Pre-filter – Pre-filters are attached to pond pump’s intake. They are used for smaller ponds that accommodate about 200 to 500 gallons of water. Pre-filters are constructed so that leaves, fish waste, and algae are collected before they get into your biological filter. Pressure Filter – Perhaps the most popular pond filter, pressure filters are an easy to use filtration system. They are compact, user-friendly, and does not require too much maintenance. Cleaning out pressure filters are easy because most systems have an inclusion of the backflush system. Pressure filters are commonly used in small to medium sized ponds. They act as a mechanical filter by pushing water into a filter sponge which then collects the debris, objects, and particles that you want to be removed. Pressure filters are very versatile because they can be used in any types of ponds whether with streams, waterfalls, or fountains. In addition, they can be installed either in the ground or above the pond’s water line making it easier to hide them and not disrupt the whole landscape and beauty of your pond. If you read further, many pressure filters have an attaching UV clarifier that prevents the buildup of algae in your pond. Waterfall Filter – Waterfall filters are used for ponds who have an additional waterfall display. They are not pressurized therefore they must be placed above the pond’s water line. Common waterfall filter provides both an efficient biological filtration system and mechanical filtration system. In buying a waterfall filter, always check its capability in providing crucial aeration. Waterfall filters are designed in a way so that they can be easily installed to an existing pond and be hidden into the landscape and display by placing rocks or other landscape beautification materials. In addition, if you like the sound of flowing water, waterfall filters provide a very relaxing freefalling water sound. UV Sterilizers – Ultraviolet sterilizers are not only commonly used in aquatic equipment. Its application has expanded into the medical field as well as every human’s water consumption. Although they are not really what you call a pond filter, UV Sterilizers have been commonly placed in addition to a biological filtration system and mechanical filtration system. The UV sterilizer’s role consists of removing and preventing any form of algae buildup. They can also destroy the free-floating bacteria commonly found in ponds such as fungi, viruses, and bacteria. Thorough research is required when purchasing a pond filter. Water Pumps – This is the most important piece of equipment that must be paired with the pond filter. Water pumps should be chosen according to the type of your pond. Water pumps will act as the navigator of the water so that they can pass through the filtration system provided by your pond filter. You must also take into consideration the pump pressure and pump volume. This will determine how fast the filter and pump combination can clean out the water. It is advisable by the majority of pond keepers that when you are buying a water pump, you should always invest in a high-quality one, regardless of the prices. Cheap water pumps will cost you a lot more in the long-run because it will use more electricity and will often break or not fully function, which could lead to an accumulation of harmful gas in the pond, potentially killing your fish. Energy Consumption – Maintaining a pond is not cheap hobby or activity but it does not mean that you have to break the bank to have one. Always take into consideration the voltage and energy needs of the pump that you are buying because pond filters need to be up all day and all night. Amount of water – The first thing you should always know about your pond is the size/capacity of the water that it can hold. While generally, most pond filters can be used in both small pond and bigger ones, there are pond filters that can accommodate only a specific amount of water. Budget – Setting out your budget will surely help you narrow down your choices. There is no point in browsing through hundreds and thousands of pond filters when you are on a tight budget. That is why it is always beneficial for you to set a limit on the money that you would spend, after taking into consideration the other factors. However, most experts and pond keepers recommend to not be so uptight with a budget when it comes to pond filter. Since they are essential to the pond’s health, they are going to run 7 hours a week and 24 hours a day. Work out the level of filtration needed – There are tons of formula that can determine the amount of filtration needed for you which you can find online. When computing, make sure that you know the size of the length, width, and depth of your pond to determine the volume. You also need to keep a tab on how many fish you have in your pond so as to determine the minimum filter size required. Type of filtration – As previously discussed, there are commonly two types of filtration system: the biological filtration system and the mechanical filtration system. As a pond owner, you have to decide whether you want only a certain filtration system, or you want a piece of equipment that works as a dual media filtration system. In addition, there are also UV Clarifiers to consider, which reduce the amount of algae in your pond. So, it is in your best interest to determine what your pond needs so that you can narrow down your choices and find the best pond filter that is functional and cost-effective to your needs. Location of the pond filter – You also have to take into account where you intend to place your pond filtration system. There are two types of filtration system that considers the location of the pond filter: External or Submersible (Internal). There are different advantages and disadvantages in each type of pond filter. Submersible filters are those are placed directly inside the pond. While they are mostly intended for smaller ponds that can clean out less than 2000 gallons, they are easier to plumb. However, submersible filters also have their downsides. They are difficult to wire for electricity considering the dangers of contacting water and electricity. They are harder to clean because you have to take them out of the pond first to gain access to them. On the bright side, Submersible filters are easier to disguise and would even look like they are non-existent. So, if you are particular with the way your pond looks, then this is the pond filter for you. External filters, on the other hand, as what its name suggests, are installed outside the pond. They are usually larger in size and intended for larger ponds, some can even accommodate up to 21,000 gallons. While it is easier to wire it for electricity and gain access for cleaning, it is harder to disguise them. Some even install their own housing that protects the pond filter from animals or anything that might topple it over. If you are a newbie in pond keeping, then you have come across the best article that will help guide you on what to do with your pond. Pond Keeping is an extremely beneficial hobby because not only are you helping the ecosystem thrive, you can also add beauty to your home while having a relaxing time. Ponds are not so hard to take care of but here are few of the do’s and dont’s that you should remember. DO position your pond properly. It is advisable that ponds should be located in area that gets enough sunlight to sustain the growth of plants. Also, it is best to place your ponds where it can be viewed directly from your house in case a child might fall off. In addition, if you do have children, make sure that the pond has fences to avoid any accidents. DO NOT place a pond where there are overhanging trees and invasive roots. This is an extremely important tip to note because overhanging trees will produce a lot of falling leaves that will eventually fall in your pond. Although you have a pond filter, it is still best to prevent extra work for it than to let it work twice as hard. Invasive roots must also be avoided because they have the potential to destroy, damage, and crack your pond landscape. DO construct a pond with a variety of depths. If you intend to make your own pond it is best to make it with increasing depths from shallow to deep. This will attract different types of species and encourage the growth of a variety of plants. DO NOT construct a pond with a weird, complex, or irregular shape. While we do not condemn any artistic and creative pond ideas, we do suggest avoiding any erratic shapes that might cause detriment to your pond. Complex shapes have a tendency to create folds and creases. Thus, there may be some parts of the pond in which the water will not eventually go through the filter. A pond can easily be decorated with other stuff and does not necessarily need a complex shape. DO take into consideration the factors that we have listed in choosing your pond. This is extremely important because it maximizes the ability of the pond filter your bought and it helps you get to know more about your pond details. DO NOT buy a pond filer based off its price. Expensive does not always mean high quality. Just because a piece of equipment has a high price does not necessarily concludes that it works well. Always research before buying and hear and read reviews by customers and pond keepers. DO check on the pond filter occasionally. If your pond filter does not come with a cleaning indicator, it is of your best interest to occasionally check it for any large debris that might have stuck in the filter rendering the filtration system effective. It only takes a while and does not do any harm and like the famous saying goes, prevention is better than cure. DO NOT use chlorinated tap water. In fact, this must actually be in a never to do list. Chlorinated water is only used in swimming pools and has no place in ponds and water gardens. This powder kills of the beneficial bacteria in the filter and might have the tendency to poison any fish or species living in the pond. Pond, as a body of liquid, is not exempt from the harsh conditions of winter. Of course, there are some people who prefer to transfer any aquatic species in their pond to an aquarium inside their home and shut off their filtration pump system. However, if you want to keep your pond in the winter, we have set out some guidelines for you. Oxygenate the water – This is extremely important if you have fish living inside your pond. This is to prevent the winter cold from freezing your beautiful pond over. You can do this by buying an aerator so that a bubble can sit on the surface of your pond’s water. Additional Water Source – Because of the cold temperature, it is unavoidable that ice damming will increase. Running water is not even safe from being iced because a sudden increase in temperature might even freeze water instantly. To make up for that loss, you can help supply the pond with water by attaching a hose inside it that connects to your house. This alternate water source will ensure that your pond’s water levels will not decrease, and your fishes and plants will have sufficient water to live. Water Circulation – As mentioned, even running water might be a victim of ice damming, that is why most of the time, the fast the water circulates the less likely it is to be iced. Pump Size is a consideration when keeping a pond during winter. Some experts say that a pump that functions 2000 gallon per hour is sufficient to last throughout the winter. Feeding the fish – During winter, the fishes have lower metabolism. So constantly feeding your fish is of no use and might even be damaging to your pond because it adds to the dirt that will eventually accumulate. Fish are usually fed once a week during winter and there are special types of feed that are sold in the market. This type of feed will sink in the bottom and this is so because fish usually stay at the bottom of the pond during winter times because it is warmer. Pond Heater – Pond heaters are extremely important for an unstable winter condition. A sudden increase in temperature might cause the pond to freeze instantly. To prevent this, you can purchase a pond heater. There are three types of pond heaters, gas-fired boilers, inline electric water heaters, and de-icers. The most popular and commonly used is the deicer. This type of pond heater floats on the surface of the pond and remains to keep an area ice-free for gas exchange. Maintenance is key – Overall, if you are really determined to keep your pond running during the winter, you have to be ready for maintenance. You must always be updated with the erratic and unpredictable weather conditions through news channels and you must always keep an eye out on your pond. Unlike during regular seasons where you can leave your pond out for days, during the winter, you have to constantly check it for ice buildups and freezing. Pond keeping during winter is always a challenge especially for those who have fishes living in their ponds. The Pond Filter market is always abundant. There are tons of pond filters that will surely satisfy your needs and preferences. 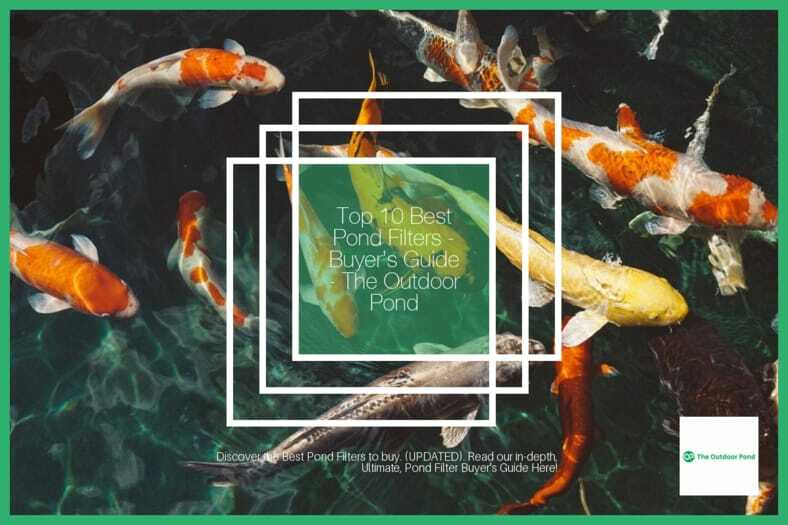 In order to help you pick the best and get your money’s worth, we have narrowed down the tons of pond filters found in the market into the top 10 best according to our research. Listed below are the Top 10 Pond Filter Systems that has received generally favorable reviews among experts and hobbyists. Not only did we consider the quality and durability of each of these aquatic pieces of equipment, but we also placed an emphasis on the customer’s needs. As such, we have listed the list below according to the least expensive the most expensive so that you will have an easier time picking the pond filter for you according to your budget. Tetra Pond is one of the leading companies in pond keeping and their products have a fantastic reputation. The submersible flat box filter offered by Tetra Pond is one of the most affordable pond filter systems you could get. Despite its cheap cost, the filter can hold a massive amount of water that ranges from 300 to 500 gallons and can pump between 200-2000 gph. Since the pond filter is submersible, it is also ideal to be used in outdoor ponds. The filter box can be placed with different kinds of pump. Included in the package is a flat filter box with filter-to-hose fitting, foam pads that are coarse, one tubing, and three different fittings for attaching the hose to a variety of pump inlets. The filter box is light and although it is submergible, there may be instances where the box will float. If after following the proper instructions, the box still floats, it is recommended that rocks are placed on top of the filter box to prevent floating. Many customers have left satisfying reviews with this product. Most of them have praised it because it surely does not clog easily and since it has a complex flat box design, it can fit different pond pumps while also being able to easily install and detach to when it is time to clean it. Most customers who have a dirty pond have vouched that the pond was free from murkiness for only 12 hours of its usage. Since the product works only as a mechanical filter, there is still enough room inside the box to add bio-filters. However, since the product is quite light, there may be some instances where you have to place a brick or a rock on top of it because it might float. But keep in mind that the proper way to place the filter box inside the pond is to hold it underwater until it fills completely with water before dropping your hands off. Despite that, many customers are extremely happy with the product and suggests buying one because of its reasonable price and its versatility. Should you ever want to change your pump, Tetra Pond’s Submersible Flat Box Filter can still be used. The product is definitely a money saver while doing the job right. It will surely make your pond cleaner and clearer than it ever was before. Tetra Pond is really a company that you can trust. When it comes to fishkeeping it is always safe to consider the products made by Tetra Pond. Included in their array of items and equipment for your pond keeping needs is the Filtration Fountain Kit with three Fountain Attachments that comes in the variety of a frothy, spray, and bell pattern. There are three sizes that the product comes with: up to 100-gallon, 50-250 gallon, and 250-500 gallon. The capability of the pump reaches a flow rate of 325 gallons per hour at a head height of one-foot maximum. The box is roomy and contains large filter pads. The filter box works as a mechanical filtration system, but the box contains enough space for you to add a biological filter inside so that you can hit two birds with one stone. As seen in the discussion above, the fountain kit is truly a great choice for your pond because the only problem, which is the floating filter box, can easily be fixed by placing rocks inside or on top of the box. Otherwise, the fountain kit has received commendable reviews by a ton of customers. Many customers particularly liked that the package includes three different fountain head options which they can easily detach and install depending on their needs. The fountain heads can also be controlled by the flow control knob which can be found on the side of the nozzle for you to be able to control the size of the fountain spray. Even without using the fountain heads, the filter box can still be used at your own convenience. Truly, the fountain kit is a very versatile tool that would really be perfect for your backyard pond or even a larger pond near you. With the fountain kit, not only are you able to clean your pond with ease but you can also add beauty and decoration to its aesthetic value with the three different fountain head options you can choose from. Pond Master’s PMK190 is a submersible filter that can clean out small ponds and container gardens for up to 300 to 400 gallons. It is cost efficient because the pump rate is 190 gallons per hour which consumes only 15 watts of electricity. The pond filter has both the biological and mechanical filtration system. The pond filter is one of the cheapest ones you could buy for any small pond pump filters. It saves energy and cost because the pump will draw only 15 watts per hour. The pump, once submerged, is very quiet even when running. It can accommodate only small ponds. Since the pump rate is low, while it is cost-efficient, if you buy this product with an already dirty pond, then it might take some days before the water clears out. The size of your pond is always taken into consideration on what is the best type of pond filter that you should use. So, if you have a smaller pond, then this might be the pond filter that you are looking for. You really do not need to buy expensive and large ones, not only do they overwhelm your pond’s aesthetic, but they can also be really expensive. This pond filter by Pond Master is truly enough for small pond owners and it comes in such an affordable rate which makes it even better. Jebao’s Pressurized bio pond filter has a very promising capability and durability. If you have a backyard pond or a nature pond with only plants, this pond filter can accommodate up to 1500 gallons. If you have a backyard pond with small fishes such as goldfish and a number of floras or plants, then this pond filter can clean up to 1000 gallons. On the other hand, if you have a pond dedicated to taking care of large fishes such as koi, this pond filter can help you out by cleaning up to 500-gallon pond. The pond filter is also very accommodating because it contains not only the two filtration systems which are mechanical and biological, but also added it with UV Clarification. The manual kit included in the package also comes with an explanation as to how this 3-stage process actually works. The UV lamps are prone to leakage, so it is best to check on it occasionally. However, you can fix this problem by simply removing the O-ring and place it inside the head of the lid. This is the recommended solution by most hobbyist and pond keepers. To avoid the leakage, make sure to check the pump on whether it pushes too much pressure on the seals. To maximize the UV light to produce efficient cleaning results, it is to be noted that when you have a heavier load or more species on your pond, then the gallon capacity is lessened. For you to be able to make us of the filter’s capacity, you need to unload some materials or objects inside the pond. The three-stage filtration system is the absolute prime selling point of this product and while it is actually very promising, there have been some complaints on the UV light. Many customers have by far commended it for its very unique ability to create three filtration systems but have also complained about the UV light. Despite that, the bio pond filter is definitely a good product for you to use if you want a biological filter and a mechanical filter all in one equipment. For its price, it is definitely worth it especially if you check on the UV light occasionally and make sure that the pressure is correct, then this product is absolutely the perfect one for you. Pond Boss’ FM002P Filter Kit is truly one for the books because of its complete package. Not only does the pump able to clean ponds with about 500 gallons of water but the pump is also an ETL listed energy efficient 320 GPH fountain pump. The pump can also collect small and large debris and prevents it being accumulated because of the patented sloped lid and two filter pads in order for you to not constantly check on its maintenance. It does not stop there, while the pump is able to do mechanical filtration, it can also function as a biological filter system with the 10 Bio Balls included providing surface area for the growth of beneficial bacteria converting the toxic substances into less toxic ones. The water spray nozzle head will surely add beauty to your pond because it can control the size of your water for aeration. There is also a diverter valve which you can use for your fountain displays. The kit already contains the essential tools for a pond filter system. It is a mechanical filter, but the package already includes the Bio Balls which can do the biological filter. The kit is a perfect example of a combination of both of the filtration systems. The fountain pump, nozzle, and diverter valve are a very good addition for the pump because it not only cleans the pond but can also act as a display and decoration to add beauty to your pond. The sloped lid and the two filter pads are a great combination because it is a very efficient system in making sure that bacteria and debris are not accumulated in the box which makes checking and maintenance not a daily task to do. Like other pond filter boxes, this product by Pond Boss also has the tendency to float and flip upside down when not placed properly. So, if you are already trying to make sure that the box is filled with water inside before letting it go in the water, you can always opt to place rocks or bricks on or inside the box to prevent it from floating. This filter kit by Pond Boss is definitely one of the best kits you can get. Although it is a bit pricey, you can really get your money’s worth especially if you are looking for a pond filter that is not too complicated but still does the job well. It is energy efficient, self-sustaining, and does not require too much maintenance. The fountain tools included in the kit is also a beautiful addition to what is already a cost-efficient kit. Customer reviews have also mentioned that despite the presence of pounds of sludge that unavoidably accumulated over months of usage, the pond filter still manages to continue pumping out clean and clear water. Pond Boss’ Filter Kit pump is definitely one of the products you should consider when buying a pond filter. Another one from the esteemed company, Tetra Pond, this Waterfall filter should be one of your considerations in choosing a pond filter. A waterfall filter allows pond keepers to easily add a beautiful decoration and cleaner in their ponds because it can be attached to a submersible or external pump. The product has a mesh bag in which 6 to 8 liters of Bio-Activators may be added. The product can be used with pumps that functions at 500 to 4500 gallons per hour at a pond that accommodates 1000 gallons. The product is quite easy to assemble and has a chameleon effect because it can naturally blend or be hidden in between rocks and pond decoration. The waterfall filter acts as both a mechanical filtration system and a biological filtration system. You can also add an open profile bio-activator which provides a large active surface area so that the beneficial bacteria may be able to accumulate and colonize. The Waterfall Filter can add a touch of fun and beauty to an otherwise dull pond by providing aeration at a height of 12 inch. You can always choose at your own preference whether you want to use a lava rock or a bio-activators to be used in the biological filtration system. The beneficial bacteria will naturally accumulate on the rough surfaces of the rock or the activators. The dual media, biological and mechanical filtration system, saves you space and money from having to but two separate pond filter pumps. Because the product only works as a filter, there is a need to buy a pump separately to allow the water to freely flow through the filter. The package also does not come with tubing of its own, so you have to make sure that you purchase a tube that fits perfectly. This tube can certainly be found in the manufacturer’s store. As expected from a product produced by a 50-year old company such as Tetra Pond, the waterfall filter is truly one to consider buying. Most customer reviews have praised it because it is simple, easy to install, and cost-effective. A buyer even commended the ability of the waterfall filter to clean out his pond in only just a day. Not only that, it is also cost-efficient because you could always opt to go for lava rocks which are cheaper than bio-activators. The waterfall filter also has minimal noise because the water does not suddenly drop but is actually free falling. It can also be easily hidden which is beneficial for you if you have a certain idea of how your pond should look like without having to tolerate a pond filter that is overwhelming your display. The waterfall filter can be covered with rocks, sand, or soil for it to be kept hidden. Best Choice Products is truly one of the best options you might want to consider if you are looking for a pond filter. It can keep your pond clean and pristine making sure that your fishes will remain healthy. It can accommodate up to 2500 gallons of water for ponds that a normal fish load while it can clean out ponds up to 1500 gallons for a heavier fish load. It has a UV light that lasts up to 8000 hours that can prevent the build-up of algae and a backflush feature that can be used to clear out any debris, solid objects, and contaminants without hassle. It is also equipped with a cleaning indicator that informs you if the pump needs cleaning so that you do not have to constantly check the pump itself. The Pressure Bio Filter works both as a biological filtration system and a in integrated UV clarifier. This is a very good combination in keeping your pond healthy and clean because it removes toxic substances as well as prevent any algae build-up. The kit also does not need to be assembled therefore making it easier to install and use. Many owners and pond keepers recommend this product because aside from its promising filtering abilities, cleaning the filter is also a walk in the park. Not only does it have a cleaning indicator to inform you, but it also has an efficient backflush feature that cleans out any contaminants found in the filter. The kit does not include a pump and it must be bought separately. Upon cleaning the filter through the backflush feature, unfortunately, it is unavoidable that some water would still go back to the pond through the back-flush port. As one of the highly recommended products, this pond filter by Best Choice Products is truly one to look out for. Many experts have constantly placed this product in their recommendations list, and we are here to affirm their opinions. The product works really well and effectively. Even if there are already algae present in the pond when you purchase this product, this can efficiently clean that out in a matter of hours and days. Although the price is a bit on the more expensive side, this is definitely worth the money because most experts have kept this pond filter running for years. This is so much better than buying cheap ones which you will eventually replace in months to come. So, if you are looking for a bang for your buck then this pond filter by Best Choice Product needs to be in your considerations. OASE is a trusted brand when it comes to aquatic equipment. Therefore, the products they produce are of outstanding quality and this Filtral UVC 700 filter is no exception. The OASE Filtral 700 works as a multifunction pump. It is a compact all-in-one pond filter intended to be used in smaller ponds that only accommodates up to 700 gallons of water. It is highly recommended to avoid using this pond filter in swimming pools and salt water. The pond filter acts as both mechanical and biological filtration system with an additional UV Clarifier ensuring a clean and clearer pond. Included in the package are fountain nozzles if you want a little display for your ponds. Without the nozzle, the pond filter can still display a small stream of waterfall using the diverter valve with flow control. The pond filter must also be fully submerged to avoid floating and ensure that it stays inside the pond. Although the price is quite expensive, it comes with different attachments such as fountain heads and already contains a pump. The interchangeable nozzles are a great addition to an otherwise already functional piece of equipment. It can add a little touch of fun and beauty to your small pond. It is very easy to install and hide because it must be submerged inside the water thus it avoids disturbing the appearance of your pond. Must be strictly used for small ponds only. It is not very versatile as it can only carry 700 gallons of water. Although the pump is already included in the kit, it is also not very strong as it can also produce 250 gallons per hour which is one of the lowest pump rates in any products. OASE’s products are always to be trusted in any aquatic needs. This one in particular, caters to a small number of experts and pond keepers because it can also accommodate only a small pond. The price may be quite expensive for such a low powered piece of equipment. But, if you are an owner of a small pond, this is actually the best deal out there for you. You might be turned off by the high price, but it will surely last you a long time. Moreover, the product has a decent all-in-one filtration system which is usually rare. It has a biological filter system, a mechanical filtration system, and a UV clarifier. It also includes a pump in the kit which makes it easier for you to install because you do not need to buy it separately. Overall, this kit is definitely worth the money if you have a small pond. It is compact, complete with attachments, contains fountain heads for decoration, all while doing a decent job. OASE has stood the test of time and is already one of the most established aquatic equipment providers. It started in 1949 and up until now has absolutely been the best in their craft. Their product is definitely in our recommendation list especially with pond keeping because of the Bio Smart 5000 Pond Filter. This pond filter acts as both a biological filtration system as well as a mechanical filtration system. In this compact package, you already have what you need. It is able to clean out ponds up to 5000 gallons without fish, 2500 gallons if you have small fish, and for smaller ponds that houses koi, it can clean out 1250 gallons. This pond filter is intended to be used outside of the water garden and does not need to be pressurized. One of its outstanding features is the presence of not only a cleaning indicator but also a temperature indicator which is efficient in telling and informing the owners when maintenance is already necessary. The temperature indicator is helpful for you to know the pond’s temperature and the cleaning indicator is also convenient for you to instantly know when to clean the pond filter without having to necessarily check up on it all the time. The cleaning system is definitely one of its best features and most praised because you do not even have to manually clean the filter. It is self-sufficient and saves you time and energy. It provides both biological and mechanical filtration systems which can save you time and money from having to buy two products separately. It has a higher surface area as compared to other products which made its biological filtration system capability more effective. OASE’s Bio Smart Pond Filter allows fish loads and can still accommodate up to 5000 gallons. Like other products, there are also some issues with this item. For its part, most customers had a problem with the output valve. The output connection is said to be not designed properly and some of the dirty water went back to the pond. If you are experience the same trouble with the output valve, then some experts actually made their own solutions by buying replacement parts. This is inconvenient because the product is already expensive, but you still have to but an output valve on top of $177 spent. This product by OASE is definitely an almost perfect product except for some issues. Like they said, nobody is perfect and so are pond filters. While the two filtration systems have worked well, many customers actually had a problem with the output valve. Despite that, we hope that OASE takes notes of this and actually improve such issue. Otherwise, the product is a really promising pond filter equipment. The integrated cleaning system is also convenient because you do not need to remove the filter pads for them to be cleaned and maintained. This is also a unique pond filter because it uses gravity and does not rely on pressure to do more work. If you are looking to make your pond clean and clear, then this OASE product should be in your considerations. Once again, Tetra Pond offers one of their highly coveted products to your pond keeping needs. This time the Bio-Active Pressure Filter is an all-in-one piece of equipment that has both a biological filtration system and a mechanical filtration system. Not only that, it also includes a UV Clarifier which protects the colonization of algae. This UV Clarified can even be used or not used depending on your preferences or needs. The equipment also consists of the coveted backflush feature which makes the cleaning process much simpler than other products. The Bio-Active Pressure Filter comes in three sizes: BP1500 can carry 1500 gallons at a height of 18.75 inches; BP2500 can accommodate a pond with 2500 gallons of water with a height of 22 inches; and lastly, the BP4000 which has a height of 25 inches can clean out ponds up to 4000 gallons. The pond filter has a unique open bio-activators that can remove debris and dirt from the water and provides a large surface area to ensure unrestricted water flow through all surfaces. It has an effective biological filtration system which has an open bio activator to ensure unrestricted water flow. The pond filter can be buried in the ground if you want to hide filters so as to maintain the aesthetics of the pond. The UV Clarifier is already included in the package which can be installed according to your own preference. The water also passes through a tube if you install the UV sterilizer which makes it easier for it to come close to the light and be sterilized. Semi-Automatic back flush cleaning system has made maintenance a ton easier because you just need to position the output valve into the drain and turn the handle. The bio-activator works both as a mechanical filtration system and a biological filtration system. While this is a good thing, the absence of a dedicated mechanical media makes it harder for the biological filtration system to take effect especially if there will be debris and objects stuck in the filter. This will require regular cleaning through the backflush valve system. Although cleaning the pump is made easier with the backflush, most experts say that it still needs to be regularly cleaned, almost weekly, to remove the debris that was filtered. When the pump is constantly being cleaned due to the overwhelming presence of debris, oxygen content might be reduced, and the beneficial bacteria might die out. Tetra Pond never fails to provide yet another product that you can surely trust. This pond filter is first of all, easy to install. It only works dually as a mechanical and biological filtration system which can save you money, as well as space, instead of buying two separate products. The UV Clarifier also adds to the efficiency and cleanliness of your pond water, making it more clearer and algae free. The only drawback is the need for cleaning it out occasionally, but surely, if you love your pond you would not mind simply using the backflush option every now and then. Most experts also recommend this product because it is durable and can surely last a long time, something that you will expect out of a Tetra Pond product. Simply, this bio-active pressure filter is an overall commendable choice for your pond keeping needs. Your koi, goldfishes, and other species relying on your pond water will surely feel the love with this pond filter. Pond filters and pumps might be tough and durable equipment that helps keep your pond clean and pristine. However, just like how we say, “No man is an island”, the same applies to pond filters. There are additional items that your pond filter needs to maximize its capability in cleaning out the substances and dirt found in your pond. To help you in finding which items are useful, we have listed below other important stuff aside from the pump and filter, that goes together to make the most out of your pond filter. Bio Balls – If you read through our list, Bio Balls are repeatedly found included in some packages while others recommend its use. So, what are bio balls? In biological filtration, we have mentioned that there are beneficial bacteria which converts the ammonia into nitrate. These bacteria do not only float inside the pond filters because they actually have a home, and that home are the bio balls. That is why some mechanical filters can also act as biological filtration system by adding bio balls in the inner housing of their pond filter or containers. Lava Rocks – Like Bio Balls, lava rocks are also great addition to your pond’s filtration system. Beneficial bacteria thrive in the lava rock’s large surface area. They will colonize and grow there making the pond cleaner and toxic free. Filter Foams – Most often than not, pond filters already have filter foams included in the package. But it is not safe to say that you would not need to buy another one because just like sponges, filter foams may over time accumulate dust and debris to render it useless. Solid particles cannot entirely be squeezed out of the foam that is why it is best to have one ready at your disposal. Fountains – Fountains are not that essential in pond maintenance. But, since some ponds were intended to attract viewers and add beauty to your back yard or to your home, a fountain will definitely boost the appearance of your pond. The market is full of fountain heads that has a variety of display. If you intend to put a fountain, it is really better if you could buy one that could be attached to your pump. In that way, not only are you able to clean out the pond water but you are also doing your home a favor by creating a beautiful display. Valve – If you want to control the water flow of your pond water, you can always purchase a valve that will help you with that. Valves will easily help regulate the water flow to prevent leakage and make the most out of your pond filters. There are many promising Pond Filter out there and picking one as our top recommended was no easy feat. In all honesty, we had a hard time choosing between Pond Boss’ FM002P Filter Kit and Tetra Pond’s Filtration Fountain Kit. But after many considerations and further research, we have to give it to Tetra Pond’s Filtration Fountain Kit as the best pond filter for you. Tetra Pond has existed for decades and has mastered the art of making aquatic equipment and this product is no exception. Not only is the product more affordable than most of the products listed, but it also comes with a fountain kit making it an all-in-one compact pond filter. It can easily act as a filtration system and a decorative system for your pond all in one go. We hope this article has helped you learn about pond filter equipment. We also hope that because of our list, you picked the pond filter suitable to your taste and functional needs.